During the late 1880s and 1890s, student YMCAs were organized on college campuses throughout the United States. In 1908, Princeton University professor Dr. Walter Mead Rankin founded the YMCA Town Club located at 16 Witherspoon Street. A reflection of the social mores of the time, the Town Club served only the white community. At about the same time, several men in Princeton’s thriving African American community began meeting for educational, social and religious activities. They met at Douglas Hall, located on the corner of Witherspoon and Maclean Streets, in what was previously the Witherspoon School for Colored Children. They also met in a basement room of the house where Paul Robeson, the noted black actor, singer and orator, was born. In 1912, the Town Club opened a branch known as the Witherspoon YMCA whose purpose was the religious, mental, social and physical development of Princeton’s African American men and boys. The Witherspoon YMCA was located in a building at 102 Witherspoon Street and offered courses in English, arithmetic and bookkeeping, as well as weekly lectures by university professors. Initially, its board of directors was comprised of white members of the business and academic community. By the early 1920s, the organization was directed by African American members of the community with chairman Howard Waxwood, Sr. at the helm. Other local prominent leaders were Albert Hinds and George Reeves, Sr. 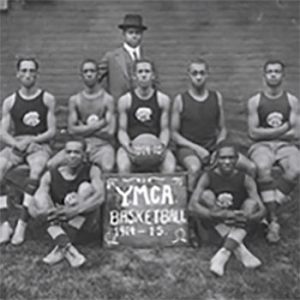 In 1923, the Federation of Town and Country YMCAs of Mercer County was formed in Trenton to enlarge the scope of the YMCA’s work in Mercer County. Among the groups organized at that time was a Princeton YMCA branch, which met at various locations throughout Princeton. This branch operated in addition to the Witherspoon YMCA. As YMCA programs and membership increased at Dorothea’s House, it became clear that the YMCA needed its own facility. With the Princeton YWCA also facing the need for its own building, the YMCA and the YWCA agreed to establish a joint corporation named the Princeton YMCA/YWCA. Together they conducted a fund-raising campaign to build a facility on Avalon Place. The building campaign called for raising $750,000. The YMCA contributed 4 ¾ acres it had purchased from the van Dyke estate located next to Dorothea’s House and the YWCA contributed $40,000. 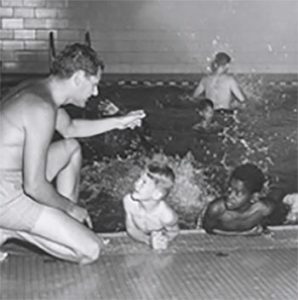 With the opening of the new facility in 1958, the Princeton YMCA expanded its programs and membership significantly. Recreational and instructional swimming was conducted in the new pool and a Flying Fish Club competitive swim team was organized. The Y offered sports such as track, touch football, archery, baseball, tennis, tumbling and basketball. There were coed social activities, HI-Y Clubs for boys in grades 6-8, Junior Leaders Club, Toddler Club for 3-5 year olds, radio club, wrestling and horseback riding. Though the new facility on Avalon Place allowed for increased program opportunities and membership, the YMCA continued to use Dorothea’s House for some administrative and program activities. The Princeton YWCA also felt cramped in its program development. In the early 70s, the YMCA/YWCA launched a capital fund drive with the purpose of raising $1,600,000 to add several new parts to the existing building: a gymnasium adjacent to the pool, meeting rooms, nursery rooms, and administrative space for the YWCA. The YMCA raised an additional $200,000 for the cost of building a health club. The Dodge Gymnasium (named in honor of the Dodge family) and the Mathey Health Center (named in memory of Dean Mathey) was dedicated in 1972. One of the most popular activities at the YMCA for teenagers in the 1960s and 70s was a program started in 1962 called Youth Speaks Up created by volunteer Herb Hobler. The program offered teenagers from 27 high schools in Central New Jersey the opportunity to operate their own weekly radio program on WHWH, the local radio station. The students wrote and produced their own program, which featured interviews with public figures. The program won several national and state awards. The Princeton YMCA was fortunate over the years to have many dedicated members of the community serving on its board of directors, committees, and fund-raising campaigns. These men and women have devoted long hours to supporting the mission of the YMCA—to enrich the spirit, mind and body and improve the quality of life for people in Princeton and the surrounding communities. The Executive Club, an auxiliary group that enlists the help of local executives and civic leaders in raising funds and promoting the mission of the Princeton YMCA, was founded in 1961. The annual dinner features a keynote speaker and over the years, the list of featured speakers has grown long with prominent names including CEOs, writers, university presidents, journalists, economists, political figures and other luminaries. The evening’s proceeds continue to benefit YMCA youth programs. In the early 1980s, the Princeton Family YMCA started offering full facility memberships to women, and women were elected to the board of directors for the first time. The YMCA became a destination for the entire family. Although health and wellness have always been central to the YMCA mission, in the 80s and 90s there was renewed interest in healthy living. The YMCA rededicated itself to helping people of all backgrounds achieve their personal fitness goals by adding sports and wellness programs to its offerings. Childcare became a vital part of YMCA programs to meet the changing needs of families as women joined the workforce. No longer just a club that met a few times a week, the child care program increased to include full-day programs for children eight weeks to five years old. After school programs and holiday camp became available for children in grades K-8. The 90s brought a renewed commitment to the Judeo-Christian principles on which the YMCA was founded. The YMCA’s four Core Values – Caring, Honesty, Respect and Responsibility – were introduced. These values are what distinguish the YMCA and shape it as one of the community’s most important sources of social capital, making neighborhoods safer, schools better, and people healthier. To inspire and support the “health seeker” – the person who looks for fellowship and support among others who share a mutual goal of living a healthy, holistic lifestyle. To be the place where today’s busy families find a network of people and programs dedicated to helping them grown strong. To serve as a coalition-builder among young people who wish to serve their communities, and practice values of charity and philanthropy. As we have for a century, our YMCA is committed to ensuring access to all who seek it, regardless of ability to pay. In the last decade, more than $1 million has been awarded to children and families in need.